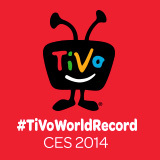 Today, at the Consumer Electronics Show (CES) in Las Vegas, TiVo demonstrated a network DVR prototype for operators, and announced the plan to bring the TiVo Roamio DVR experience to the Cloud with network recordings seamlessly integrated, easily searchable and available anywhere – anytime. The TiVo NDVR is a natural extension of the TiVo solution. Using TiVo’s Emmy Award Winning cloud service, the nDVR will extend the TiVo Service and consistent user experience on every device while enabling consumers to easily find, consume and socially share cloud delivered content through the TiVo user interface. This is critical for operators as they consider a transition to IP delivered content and utilization of low-cost IP clients and consumer provided devices while enhancing the user experience anywhere they may be. TiVo will extend current features and functionality and plans to enable new consumer features that enable co-viewing experiences through social networks and recommendations across disparate libraries of content. In addition to moving the Roamio experience to the cloud, TiVo would be enabling operators and programmers to manage complex content rights, create multiple tiers of network PVR features, and enable multiscreen policies that accelerate the critical transition to an all IP video world. For instance, operators deploying TiVo’s NDVR could offer a premium service with expanded catch-up and save options. The service could also empower programmers to more intelligently target advertising in cloud hosted time-shifted content. TiVo is excited to deploy the nDVR, and to see what this extension of the TiVo solution has in store!